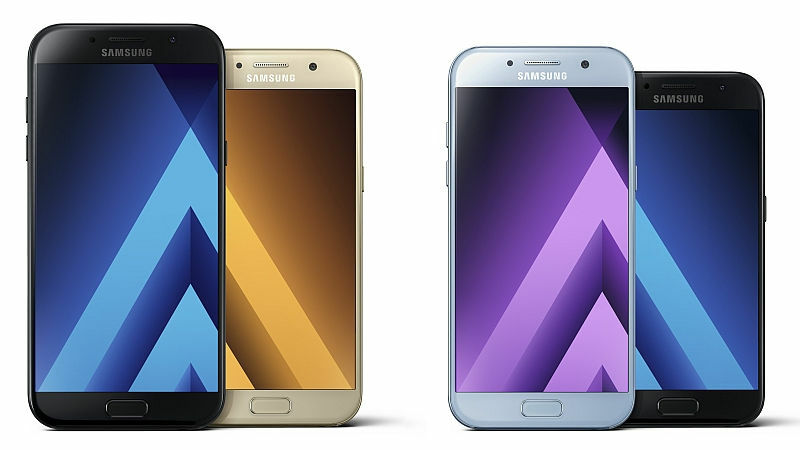 Samsung finally unveiled the details of 2017 addition of “A” series smartphones. Galaxy A3 (2017), Galaxy A5 (2017), and Galaxy A7 (2017) are the highlight of A series. All of these smartphones will go on sale in Russia in upcoming days, while there is no information about launch of these phone in other countries. Samsung says that 2017 addition of these phone comes with enhanced camera which is optimized for low light conditions. Samsung also says that camera UI is made simple for selfie, pictures, switching modes, or applying filters and effects. Performance of the phone is also enhanced for multi-tasking and gaming. Pricing of these phone is still not know. 2017 addition of A series comes with IP68 certification, which insures that phone is water and dust proof. If we discuss the design, phone comes with metal frame and 3D glass panel at back, hence phone looks more premium. All three phones are coming in Black Sky, Gold Sand, Blue Mist, and Peach Cloud colour options. As a plus point over 2016 series, these new phones are also coming with fingerprint scanner, SD card slot up to 256 GB, fast charging with USB type-C and always on display. All three phones are running on Android 6.0.1 Marshmallow operating system. These phones also feature accelerometer, ambient light sensor, barometer, magnetometer, and proximity sensors. Samsung Galaxy A3 (2017): Phone features 4.7 inch HD super AMOLED display with 720×1280 pixels resolution. Phone also features 13 MP rear & 8 MP front facing camera. Phone is powered by 1.6 GHz octa-core processor with 2 GB RAM and 16 GB internal storage. Galaxy A3 is backed by 2350 mAh battery. Samsung Galaxy A5 (2017): A5 features 5.2 inch full-HD super AMOLED display with 1080×1920 pixels resolution. It sports 16 MP rear & 16 MP front facing camera. Phone is powered by 1.9 GHz octa-core processor supported by 3 GB RAM and 32 GB internal storage. This smartphone is backed by 3000 mAh battery. Samsung Galaxy A7 (2017): This smartphone features 5.7 inch full-HD super AMOLED display. Galaxy A7 is powered by 1.9 GHz octa-core processor clubbed with 3 GB RAM and 32 GB internal storage. This phone also sports 16 MP rear as well as 16 MP front facing camera. Phone is backed by 3600 mAh battery.